It was the ’70s: teenagers embraced bell bottoms, sunglasses, and love songs — all behind closed doors. In the newly established People’s Republic of China, the decade was not a period marked by hippie movements and music festivals but by tumultuous social reform and impending war. The Chinese film Youth, directed by Feng Xiaogang, who is dubbed the ‘Steven Spielberg of China,’ premiered at the Toronto International Film Festival last fall. It debuted at North American theatres in mid-December, and while it found tremendous success with domestic Chinese audiences, it may have been perceived as too foreign for other viewers. Youth follows the lives of two young dancers in the People’s Liberation Army dance troupe. Liu Feng, whose name mimics the Communist party martyr Lei Feng, performs acts of unhindered and naïve kindness in the hopes of fulfilling the prophecy of his name. He Xiaoping is an outcast who wishes to abandon her background and start anew by contributing to the army. Despite their occasional and hidden experimentation with counterrevolutionary fashion and music, the dance team remains optimistic about the revolution and expresses their patriotism through dance. Their morale is short-lived, however, after the protagonists are sent to the frontlines of the Sino-Vietnamese War. Without overemphasizing politically sensitive topics, Feng is able to portray the ups and downs of young adulthood in a devastating period for China. Accompanied by washes of sepia, each dance scene evokes feelings of nostalgia and romanticism. The protagonists have dedicated the peak of their life to their profession, and only through the fantasy of performance can they live out the hopeful dreams of their youth. There is a change of tone toward the end of the film. Liu Feng, now a jobless veteran, finds himself standing in front of a red Coca-Cola billboard in the wake of China expanding its economy. The protagonists’ former teammates are now successful business owners abroad while they, the most dedicated of them all, struggle to make a living. Cold reality sets into the scene while Liu Feng and He Xiaoping reminisce — they have finally achieved martyrdom by sacrificing their idealism and youth to the revolution. Youth is a melancholy story about the fragility of youth and the failures of a revolution meant to eliminate the elite. Though its execution does sometimes fall short with respect to its overly sentimental acting, it offers a different perspective on the coming-of-age genre. It’s certainly a breath of fresh air in Chinese cinema. While the movie is strictly in Mandarin with English subtitles, the experience of youth is universal, and Youth should be seen by everyone. The Song Dong Communal Courtyard exhibit at the AGO. Courtesy Andrea Jo Wilson. On Saturday, January 30, contemporary Chinese artist Song Dong opened his latest art exhibit, Communal Courtyard, at the AGO. The exhibit is an homage to Beijing’s rural living spaces and features more than 100 vintage wardrobes linked together. Collectively, they form a series of labyrinth-like pathways, an artistic homage to domestic life in rural China. The installation is part of Dong’s The Wisdom of the Poor series, a project that began in 2005 and focuses on low-income communities in, and around, Beijing. At first glance, the wardrobe doors appear to be quite similar. Each appears to be crafted from the same wood, and all are the same shade of ochre. As it turns out, however, the differences amongst these wooden entranceways are based upon the scraps of history left on each one. Bits of wallpaper, scratches, nails, and pencil sketches help form our impression of the individual who once owned this piece of furniture. Mirrors and stained glass windows are spread out amongst various pieces of furniture as well, and as viewers walk by, they’re caught off guard by sudden reflections of themselves. Through the glass windows, visitors are able to see others walking through the parallel pathway. If a door is positioned close to another wardrobe, people are able to see both a glimpse of their reflection, and the silhouettes of other people walking by. Shared living spaces were crucial to Dong’s development of Communal Courtyard. The wardrobes and wooden doors are all taken from traditional households in Beijing prior to the city’s rapid urbanization. Dong displays these household possessions in order to demonstrate his respect for both specific Chinese homes and the suburban environment as a whole. In an interview played on screen the exhibit, the artist notes how he hopes to draw attention to Beijing’s rapid urbanization through depictions of a nation’s history. 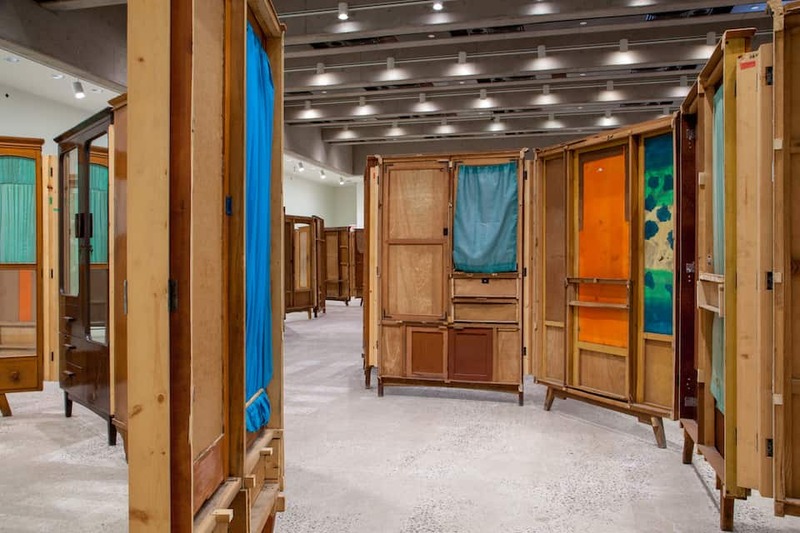 Since the Communal Courtyard is part of a larger collection, Dong notes how he strives to “incorporate the state of poor people wisdom into [his] work.” Dong shows how a community is “sharing public space,” and keeps it through an interactive installation of linked vintage wardrobes. The overall enthusiastic mood in the gallery contributes to the visitors’ interest. As new viewers walk in, their curiosity is attracted by those who have already started exploring the Communal Courtyard.